As major global greenhouse gas emitters, U.S. states have the economic heft and legislative authority to move the United States toward much lower emissions and cleaner energy. While many have done so in the last decade, some remain stuck in the high-emitting past. The following six charts show how emissions from U.S. states compare, how they are changing and what could come next. These are based on the latest greenhouse gas emissions data World Resources Institute compiled for all 50 states (through 2014, the latest year for which in-state emissions data is available). In 2014, the top 10 emitting states were responsible for nearly half of the country’s total greenhouse gas (GHG) emissions, nearly equal to the combined emissions of Japan, Canada and Germany, or all of India’s. Click around on the interactive chart to explore the emissions profile for each state. Note that the interactive chart (#1) and the donut chart (#2) do not include emissions (or removals) from the land sector, as they cannot display negative values. The remaining charts (#3, #4 and #5) and corresponding analysis include all sources of emissions. In 2014, the energy sector contributed to about 84% of total U.S. GHG emissions, with electricity generation (29 percent) and transportation (27 percent) being the top two contributors. More recent data shows transportation overtaking electric power as the biggest U.S. carbon dioxide emitter. 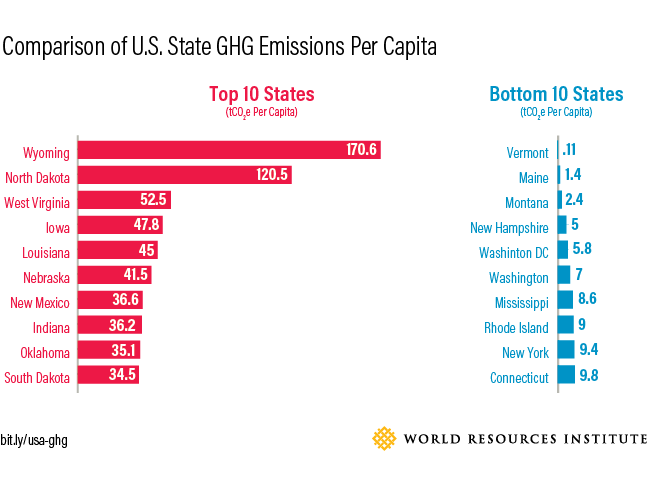 Texas and California have been Number 1 and Number 2 top state emitters for more than a decade, which comes as no surprise since both rank in the top two for population and economic size -- two important driving forces of emissions. 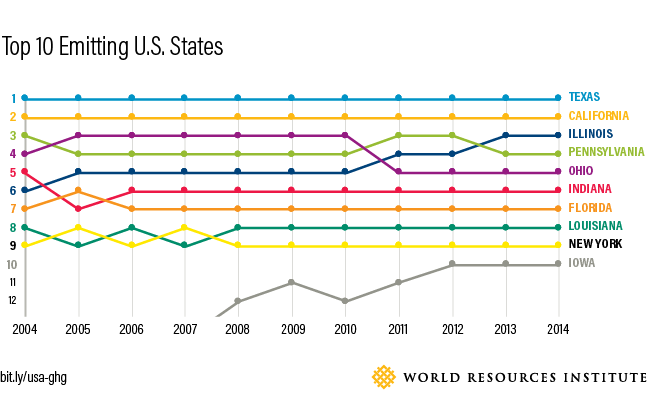 Lower down in the list, Iowa became a top 10 emitters in 2012. Even though it is a national leader in the expansion of renewable energy, Iowa’s emissions have been creeping up partly due to economic expansion across its energy and agriculture sectors even as most U.S. states have seen their overall emissions drop over the same period. When having a look at states emissions through the lens of emissions intensity – GHG per GDP and GHG per capita- the story changes. In both cases, the top emitters are Wyoming and North Dakota, followed closely by West Virginia. After that the individual rankings depend on whether the emissions intensity is based on GDP or population. Regardless, there is considerable overlap among the top 10 list for emissions intensity expressed both for their levels of emissions per person and per unit of GDP, with 9 states appearing on both lists. 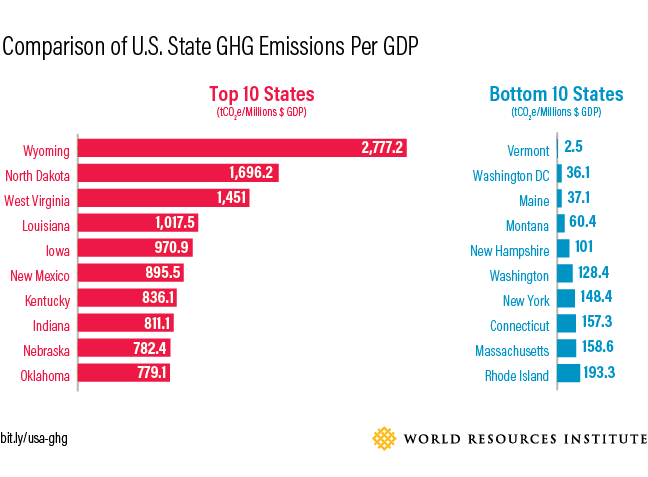 Also of note, is that Iowa and Louisiana are the only two states that rank in the top 10 in emissions per unit of GDP, per person, and in absolute amount of total emissions. Interestingly, neither of these two states rank high in terms of population size: together they account for less than 3 percent of the total U.S. population. Iowa’s heavy agricultural industry, which includes both food and biofuel production, make it one of the most energy-consuming states in the country. Meanwhile Louisiana, with its abundant fossil fuel resources, has a high energy-intensive industry sector of oil refinery and natural gas production: energy use in Louisiana’s industrial sector contributed to almost half of its total GHG emissions. New York, the third most populous U.S. state, is one of the country’s lowest per capita emitters. Since 2005 its electricity sector emissions have fallen by more than 45 percent as a result of a range of state-level energy policies that promote efficiency and renewable (such as the Regional Greenhouse Gas Initiative) as well as shifting market forces. Overall U.S. emissions declined by 6 percent from 2005 to 2014. The story varies, however, on a state-basis. Thirty-five states and Washington DC reduced their emissions from 2005 to 2014, with Vermont, Maine and Alaska leading the way. Vermont and Maine both benefit from vast forestland that acts as a carbon sink to absorb more carbon dioxide than it releases. Alaska’s reductions came largely from reduced petroleum use for transportation and lower emissions from natural gas use in industry. Fifteen states have increased their emissions, with North Dakota, Montana and Iowa in the lead. North Dakota’s increase was largely driven by the boom of natural gas and oil extraction, and the lack of standards that require operators to adopt all cost-effective measures for controlling methane emissions. On the other hand, Montana is in this group because of its small absolute emissions, which saw a relatively large percentage increase (from around 2.0 MtCO2e in 2005 to 2.4 MtCO2e in 2014) even though the state – with vast forestland -- still accounts for less than 0.1 percent of total U.S. emissions. The increase in Iowa’s emissions stems from its expanding energy and agricultural sectors, as mentioned above. 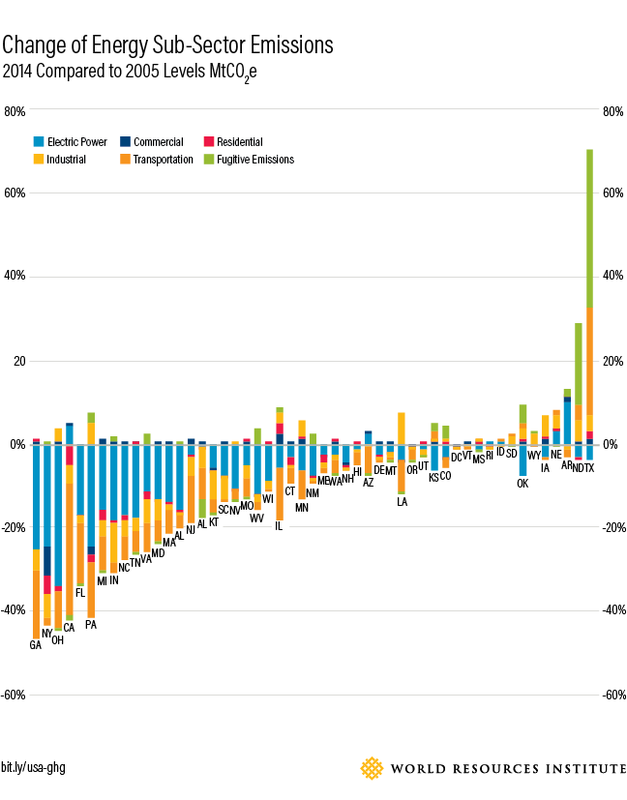 Nearly all states have reduced emissions from the electric power sector, with Ohio, Georgia and Pennsylvania recording the largest reductions. The switch from coal-fired power plants to natural gas-fired electricity generation has been one of the leading factors contributing to those reductions: all three states have halved their electricity generation from coal over the past decade according to the latest EIA data. 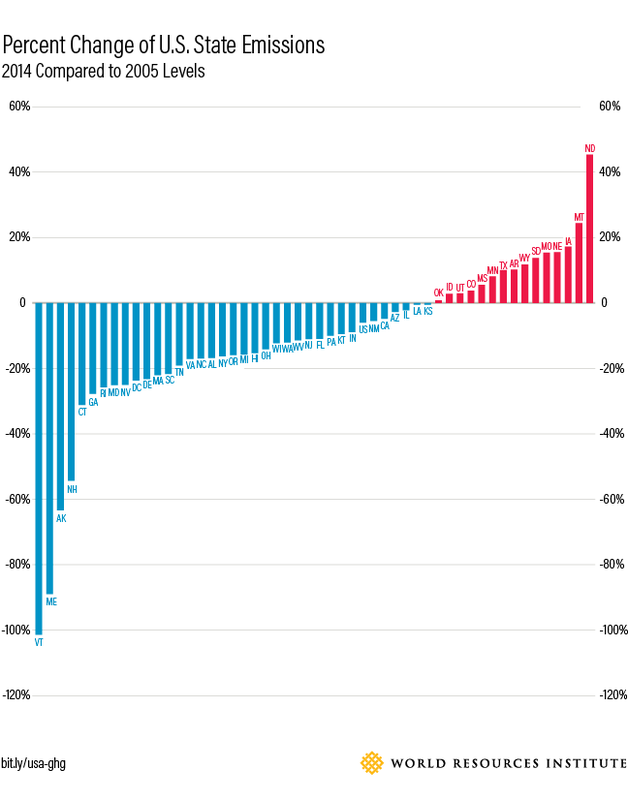 Most states have also cut emissions from transportation. California, whose transportation sector is the biggest contributor of its GHG emissions, has led the pack by significantly reducing fuel use overall with its efforts to transform to a clean transportation sector. In contrast, Texas has seen a significant increase in its transport-related emissions. North Dakota and Texas saw the largest increases in so-called fugitive emissions from leaks and other unintended releases, mostly due to increased methane emissions associated with natural gas production. With the U.S. representing a significant share of global emissions, it’s a good sign to see many poised to step up their efforts on action to address global warming in the absence of federal leadership. As we have looked to how states got to where they are, there’s a new direction being carved out through the We Are Still In coalition and America’s Pledge on climate change to determine where they are going. To reign in emissions across all sectors and prevent the worse impacts of climate change, states must accelerate a shift towards clean energy and greater efficiency. There is ample proof that this is not only possible but can also be an economic opportunity. Please Note: The State level greenhouse gas emissions estimates in the interactive chart are calculated based on the State Inventory Tool released by the U.S. EPA. Aggregating state level emissions data might differ from the national level estimate of emissions due to differences in methodology and data sources. 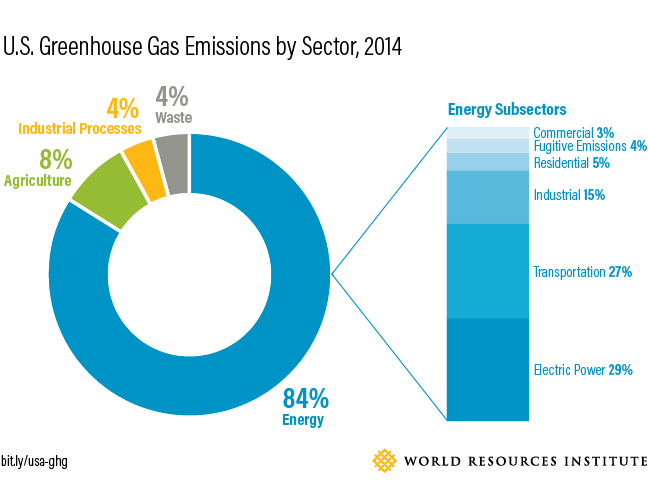 Aside from the interactive chart, or unless otherwise specified, all emissions data presented here cover all sectors (including land sector emissions) and all greenhouse gases. The land sector emissions cannot be reflected in the interactive chart due to the existence of negative values.